SYRACUSE, N.Y. (AP) Jim Boeheim finds himself in an uncustomary place – his Syracuse Orange are an afterthought as the season opener nears. It’s understandable. Syracuse is facing a major rebuild after a lackluster season. The Orange lost their best player when forward Tyler Lydon left for the NBA after two seasons and there is just one returning starter along with one redshirt freshman and four freshmen on the roster. Although Boeheim also lost his top assistant – Mike Hopkins left in March to become head coach at Washington after more than two decades under his mentor – it’s simply business as usual as he prepares for season No. 42 at his alma mater. The Orange were erratic in going 19-15 last season, the most losses in a season in Boeheim’s Hall of Fame career, and ended the year with a loss to Ole Miss in the second round of the NIT. Syracuse, which was 10-8 in the Atlantic Coast Conference in 2016-17, is picked to finish 10th this year. Syracuse also lost fifth-year seniors Andrew White, the team’s top scorer (18.5 points, 112 3-pointers), and point guard John Gillon (10.5 points, 5.4 assists). The most significant losses, though, were Lydon (13.2 points, 8.6 rebonds, 49 blocks, 49 3-pointers, 35 steals) and forward Taurean Thompson, who transferred to Seton Hall after a solid freshman year (9.2 points, 3.8 rebounds, 33 blocks). Also returning are junior guard Frank Howard, 7-foot-2 junior center Paschal Chukwu, and 6-8 redshirt freshman forward Matthew Moyer. Newcomers include guard Geno Thorpe, a graduate transfer, and those four freshmen: 6-8 forward Oshae Brissett and guard Howard Washington, both from Athlete Institute Prep in Ontario, Canada; 6-9 forward Marek Dolezaj of Slovakia; and 6-10 forward Bourama Sidibe from St. Benedict’s Prep. BATTLE’S TEAM: He’s only in his second season, but Battle, who made 60 3-pointers and averaged just over 11 points as a freshman, is ready to assume the role of leader. STILL THE SAME: Although Boeheim said at media day that he’ll tinker with man-to-man defense, expect the 2-3 zone, simply because it’s much easier to teach and there are so many newcomers. CONTINUITY COUNTS: Despite the loss of Hopkins, the Orange staff remains homegrown. It includes former Syracuse stars Adrian Autry, Gerry McNamara, and newcomer Allen Griffin and gives Boeheim a comfortable atmosphere to work in. TRANSFER CITY: Boeheim rarely took transfers in his first three decades, but he’s adapted to the changing times. Chukwu is a transfer from Providence, Thorpe led South Florida in scoring (15.1 points) and assists (4.6) a season ago, and sophomore guard Elijah Hughes left East Carolina for Syracuse (he won’t be available until next year because of NCAA transfer rules). FEWER 3-POINTERS? Syracuse averaged 76.3 points last season and relied extensively on its perimeter game, hitting 300 3-pointers and shooting 38.1 percent from behind the arc. But that strategy cost them when the shooters went cold, and with the loss of Lydon, White and Gillon – they combined to hit 215 of those 3-pointers – there’s a big void from long range. 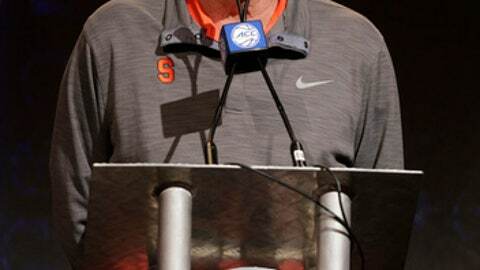 ”We’ll have to adjust and find some other way to attack,” Boeheim said. DOMINANT DEFENSE? The zone has befuddled foes for years, and the addition of some size gives Syracuse a chance to improve defensively if everybody stays in one piece. Chukwu, who was lost last December with an eye injury and did not return to the lineup, is healthy again and competing with Sidibe for a role in the middle of the zone.